Disasters & Development : A successful year for the REACT Network! On Monday 26th October, the REACT Network partners will gather in Beijing for the final activities of our year-long project. 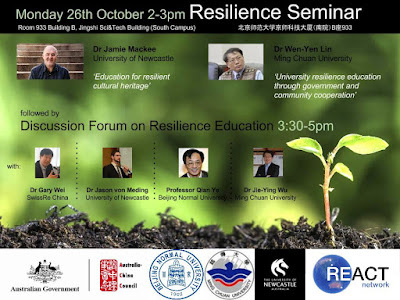 The key event (poster below) will be a resilience seminar featuring Dr Jamie Mackee from the University of Newcastle and Dr Wen-Yen Lin from Ming Chuan, followed by a discussion forum with a panel comprising Dr Gary Wei (SwissRe), Dr Jason von Meding (UON), Prof Qian Ye (BNU) and Dr Jie-Ying Wu (MCU). The REACT Network would like to thank the Australia-China Council and our respective institutions for the financial support that has allowed us to build lasting personal relationships and embark on significant collaborative initiatives. Please check back here for a report on the Beijing visit in a couple of weeks! Can i be able to join in REACT? ?